I'm ten hours into Namco Bandai's massive tactical RPG cross-over for the 3DS, and Tron Bonne just asked Tekken's Jin Kazama who violated his cornflakes this morning. "I don't eat cornflakes." With dialogue like this, who needs plot? If you really need a story to justify 60 characters from .hack, Valkyria Chronicles, Mega Man, Street Fighter, Resonance of Fate, Virtua Fighter, Tales of Vesperia, Space Channel 5, God Eater, Sakura Wars, Dead Rising and more are teaming up to take on familiar enemies on familiar battlefields, then perhaps Project X Zone is not for you. It's the Battle of the Network Stars of the gaming age — we're just here to watch them work and play together. Hell, it's even got Bruce Willis. There is a plot. It involves lots of dimension jumping and confusion. Characters are being shuffled about the multiverse like cards in the hands of Endless Frontier's Haken Browning, another character caught up in this mess. There's a mysterious woman with pink hair that seems to be behind some plot, but the only important thing about that is she has pink hair, and I'm a big fan. Gameplay-wise this is turn-based tactics for dummies. There's not a great deal of thinking involved, just move one of your ever-increasing number of two-character teams close enough to the enemy and attack. The action switches to a fighting game perspective, and timed button presses launch your character sprites into a dizzying array of signature moves. If your team has a support character you can call them in at any time. If there's another team near the one fighting, they can be called in for support as well. Fill the power meter in the bottom right past 100 percent, and you can launch a spectacular team move, complete with quick animation clips. These gorgeous spectacles of sprite choreography never get old — ten hours in I'm still letting them play out instead of skipping them. At this point I'm a little under halfway through them game. I'm probably looking at a total of 25-30 hours when all is said and done, though the stages are getting more expansive and complicated as I play. At the rate I'm playing I should be done by the end of the weekend. What's significant about the play time is that this is not a game I have to play. I was not assigned it. I have other games I need to be playing for various reasons, and still I've managed to claw away enough temporal scraps to play a significant amount. I am bringing my 3DS with me when I go out — something I've not done for ages — on the off chance I can squeeze in a bit more play. 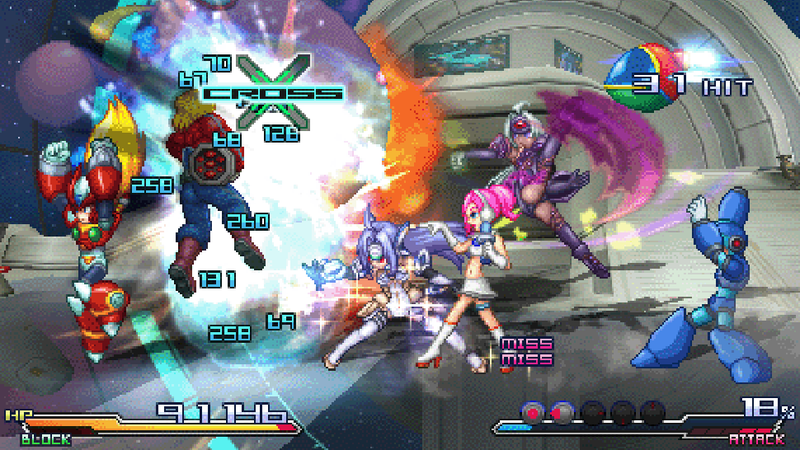 So no, I don't need a cohesive storyline to play Project X Zone. All I need is a little free time and around 60 of my closest imaginary friends.